Four generations of the island-based Black family have owned and loved this special oasis by the sea, presided over by the oldest and largest banyan tree in Puako. A well-received addition to the beloved Beach Banyan compound, the Treehouse is a cheery upstairs studio cottage seemingly slung between the graceful banyan branches. Looking out to a mesmerizing scene of ancient lava rocks and ocean waves, the Treehouse provides a unique blend of timeless island lifestyle and modern-day creature comforts. It’s a perfect hideaway for couples looking for a dreamy oceanside retreat. 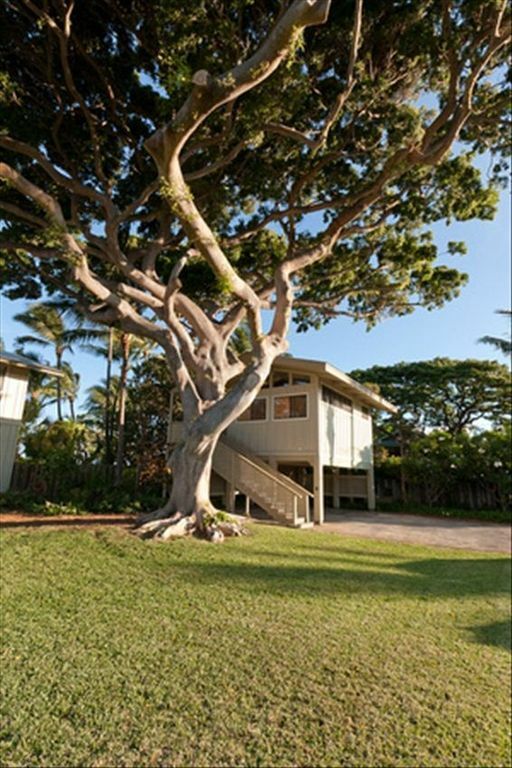 Access to the ocean is next door at the public path rather than through the yard of the larger Beach Banyan on property, and easy half-minute walk. You get the benefit of the ocean views and ocean breeze at an affordable price. The closest public access is next door, a gathering spot for some residents to watch the sunset each evening. If you like to snorkel or dive then walk 5 minutes to Paniau State Park for world-class underwater adventure. The Treehouse was the perfect private get away we'd hoped for. Every amenity was thoughtfully present, our host checked on us the first day to see if we needed anything (we didn't). As we had hoped, we felt far away from normal life, high up, seeing the ocean from one vantage point, and peering into the glorious canopy of the magnificent banyan tree in the yard to the south. We were completely separated from occupants in the larger house on the property. It was quiet and the stars were beautiful from the road. Sea turtles were literally right outside our door and excellent snorkeling was a tiny walk down the road. We couldn't have been more happy with our lodging and the gracious hospitality and smooth operations of 2 Papayas. We would definitely stay here again. Thank you so much for your review. We are so happy to hear that you enjoyed the house and it was everything you had hoped for. We would love to have you back if future travels bring you back to Puako. Pictures did no justice, we had a wonderful time and will be back again. Staff was great, location was amazing! Thank you for your review and kind words. I'm glad you enjoyed the home and location. We would love to have you back when you are in the area again. Beautiful property on lovely beach with great reef and fabulous snorkeling. Property was clean, well appointed and maintained. Loved seeing the turtles sleep onshore every night! which you can see a slice of blue. Big house has the comfort, the view, the access, the bbq. I wouldn’t go again unless we can afford the front house. It’s all about the money. Public access path to the beach leads to volcanic rock beach where you’re lucky to find space to spread your towel. My wife and stayed at the “tree house” for 5 nights. Great communication and met one of the property managers on site. Located in Puako which is a neighborhood in between resorts. We generally don’t like staying at resorts but like to visit them for their restaurants. We walked to the Fairmont via the fairly walkable coast and enjoyed their restaurants and views. The public beach access next to the home was pretty neat since you can walk along the water when the tide isn’t in. We met some of the locals during a sunset and chatted for a bit and learned about the island. This neighborhood is located 5-30 minutes from the best beaches on the island. The home itself is pretty neat. King bed was comfortable (I would suggest they get a few pillows that are a bit more substantial and firm though...). Mornings had birds chirping and the sounds of waves crashing. If you are a light sleeper, birds might annoy you but not sure if it’s because of the season. Kitchen was clean, there were a few resident geckos which were harmless and pretty hilarious since they just hung around. The garden setting and partial ocean view was pretty awesome. The natural wind ventilation was awesome. They provided beach towels, beach chairs, a small cooler and one snorkel set. It would be cool if they provided a boogie board but all good! We sat on the lanai in the mornings and enjoyed our breakfast which was a nice way to start the day. The shops at Mauna lani and the queens and kings shops were 15 min away so it was great to have amenities so close by. The harbour north of the home was 10 min away and had a few very good local restaurants. All in all, a great experience. Good value considering the resorts around here are all minimum 50% more expensive. We enjoyed our time at the Tree House. It was very thoughtfully stocked with everything we needed to enjoy our days by the ocean. Mary and Marley from 2 Papayas were super attentive and responsive to us during our stay. Quotable rates are for planning only; they are NOT an exact quote due to limits in the vrbo program. We're small, local company so sorry, but due to high fees, we do not accept credit cards. 1/4th rent due by check within 14 days of booking. Balance due 60 days prior to arrival. Each payment, once received, is non-refundable in the event of cancellation unless we can rebook dates. Christmas and New Year balances are due by September 1st. We highly recommend purchasing travel insurance from an independent agent, such as insuremytrip.com.